A shocking 40 per cent of drivers admit to checking social media when behind the wheel despite police now being able to hand out £200 on-the-spot fines and six penalty points. That's according to the RAC's Report on Motoring, which reveals that 40 per cent of drivers admit to reading texts, social media updates or using the internet when the engine's running in 2018 - up two per cent from a year before. While this figure applies to those using their phone when the car's stationary (e.g. at traffic lights), nearly one in five say they check social media when moving. Younger drivers are more likely to look at their phone while driving - but it's not the youngest age group which admits to checking social media and reading texts the most often. While 76 per cent of 17 to 24-year-olds say they never do this, that drops to 65 per cent for 25 to 34-year-olds. In 2017, the fine for using a handheld phone while driving doubled to six penalty points and a £200 fine - while new drivers will lose their licence. This applies whenever a driver is in charge on a vehicle - even if they're stopped in traffic or supervising a learner driver. Avon and Somerset Police Inspector Frazer Davey said: "As a road policing inspector I see the impact of driver distraction and people are losing their lives as a result of the use of mobile devices by drivers. “The law is clear on the use of mobile devices in vehicles and police officers across the country will continue to prosecute drivers who choose to drive while distracted on their phones." 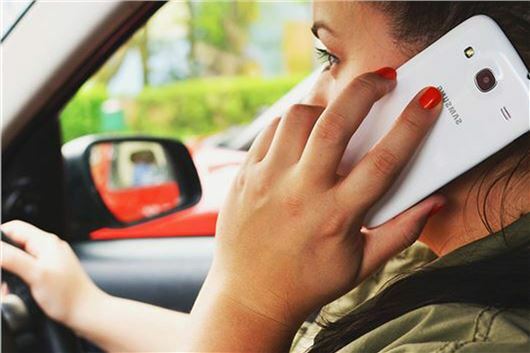 Across all age groups, a quarter of all drivers admit to illegally making or receiving calls while driving last year - up one per cent compared to 2017. While it's a problem nationally, it seems to be a particular issue in London - where more than half of drivers admit to taking or making calls using a handheld phone while driving. The penalty for this selfish and dangerous behaviour should be the same as for drink driving, and should include the mandatory confiscation and destruction of the offending phone. On the few occasions I have to brave the local rush hour, I see dozens of drivers obviously looking down into their laps, several with their phones to their ears or held in their hands, and 2 suicide jockeys watching films on hand held phones. This is a drive of no more than 10 miles, with much of the phone use spotted on a single 2 mile stretch of bypass. In the last week, at one junction I have seen a near head-on miss because one driver was staring at her phone and not turning the wheel; and a pickup truck stop and block the junction whilst looking at their phone. Plus one idiot drift into the l/h lane then suddenly swerve right, straight across the road in front of me to make the turn.